Wanted a unique and wearable video recorder for sport activities? 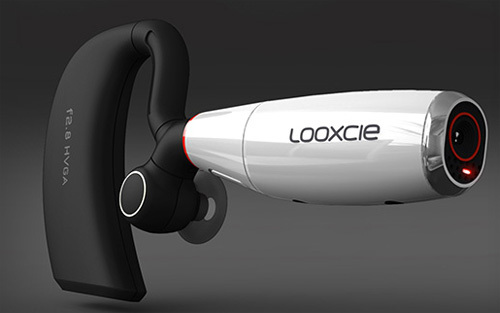 Looxcie has developed a wearable camcorder that can capture video while at the same time act as a Bluetooth headset for consumer market. Designed to be pair with Android based smartphones, the captured media clips can be viewed, edited and posted to social networking websites such as Facebook, YouTube or Twitter with free app. Looxcie is a very stylish but yet tiny Bluetooth enabled device that can point and shoot live video instantly. It records 480×320 resolution MPEG-4 video clips at 15FPS and can be stored into its internal 4GB flash storage. In order to utilize this, just download the Looxcie app directly from smartphone’ web browser and install it directly. With Looxcie app, users will able to view live video as and when you capture it, watch, share and even edit clips from original video source. The device is currently compatible with most of the Android smartphones such as HTC Nexus One, Droid Incredible, Evo, LG Ally, Motorola Droid (X/2), Samsung Captivate and many more with Android version 2.0 and above. Additional operating systems will be available by Fall of 2010 as promised by the developer. Being retailed at $199, Looxcie can last for four hours of continuous video shooting or a long 10 hours when being used in Bluetooth headset mode. No doubt, it is quite an affordable mobile accessory which could be very useful to capture special moment that will otherwise be missed using conventional camcorder.